There many options of flooring for homes today. Many people buy a home and they decide to rebuild the floors with wood or carpet and they find themselves stumped while deciding what kind of floor they want. It is a daunting task and also expensive. When we invest money into a renovation of own homes, the floor is the first thing one thinks about because the floor gives the first impression as someone enters the home. Follow me and I will relay information about the differences, benefits and disadvantages of each floor type. 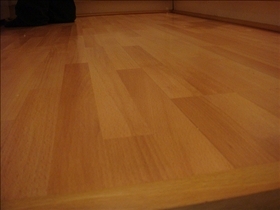 For some people quality flooring equals solid hardwood, since they perceive this material as the best one. Laminate floors are advertised as really durable ones, but we have to speak about their limitations, too. These types of floors – most of them – have photographed image on and repeating patterns, which might sound interesting. Bamboo is a popular alternative for when you are thinking about flooring, because of its similarity to hardwood. Durability is one key element that makes most buyers choose solid hardwood flooring. However there are some thicknesses that buyers should know about when picking a product. The thinner hardwoods start at 5/16 of one inch. The length of the items is generally 12-84 inches, and the traditional width is 2.1/4, known as strip flooring. However, the laminate floors last only 20 years or less. Bamboo floors are promoted by their manufacturer for their strength, resistance to insects and durability, features that none of the other floor coverings mentioned here can do as well as bamboo. 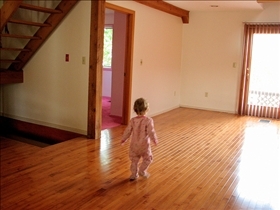 Bamboo floors are ranked by numbers and the higher the number, the harder the material is. Its hardness starts from 1180 (carbonized) to 120 (Hickory). The only disadvantage of the bamboo flooring might be - according to some reports - that it isn't as environmental-friendly as the manufacturers say it is. The main advantage of laminate floor is that they are easy to maintain, scratch and are fade resistant. Laminate floors cannot be refinished as the hardwood floors can and they are difficult to repair. When people buy a brand, they have to think about buying some more, because it often happens that brand lines decide to discontinue that line. Bamboo has been considered to be environmentally friendly by many manufacturers, but only because bamboo plants grows quickly. This leaves out all the details about the chemical trail left behind during processing, delivery and installation. Which flooring looks the best? Can you show some pictures of the hardwood floors? There are many great floors nowadays. It's important to choose wisely. Well i really like so i am going to installing it in my house..I just want to ask that is it also sun proof?If yes then i it will be great for my house.